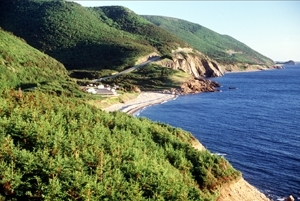 Drive the Cabot Trail, one of Nova Scotia's most beautiful roads. If you’re driving to Nova Scotia, whether by car, RV or motorcycle, the main option for getting here without a ferry is to follow Highway 2 from New Brunswick. The road crosses the provincial border near Amherst, where it becomes Highway 104. From here you can carry on to Truro (just over 1 hour), Cape Breton Island and the Cabot Trail (4 hours) or the capital city of Halifax (about 2 hours). Wave to the lady in the lighthouse as you cross the border. She’s counting vehicles coming into Nova Scotia. And don’t forget to stop at the very helpful tourist information centre. There you can pick up a free map and guide to the province, get brochures on attractions and accommodation and learn about the rules of the road. A great diversion is to leave Highway 104 at Exit 7 for Highway 4. This goes around the 45-km toll section of Highway 104 ($4 for each passenger vehicle) and takes you through the scenic Wentworth Valley. It takes a little more time than the main highway but it’s a beautiful drive, especially when the leaves change colour in the autumn. Avoid the highway entirely by taking the tiny road that leaves Highway 16 from Port Elgin in New Brunswick and takes you to Tidnish in Nova Scotia. Then follow Route 366 along the Northern Shore. You can stop at many beaches or visit the small towns of Pugwash and Tatamagouche as you drive along the beautiful coastline.